On 8 June 1861, voters in Tennessee approved a referendum to secede from the United States of America to join the Confederacy, the last state to do so. Upon the end of the Civil War, Tennessee was the first of the seceding states to have its elected members re-admitted to the United States Congress, on 24 July 1866. In the Reconstruction Era that followed, John and Sarah Watson moved their family from Georgia to Polk County, Tennessee. Rixey Ann Watson, female, born 7 March 1869 in Tennessee. Lucious and William worked the farm with their father. Arbizensy had her occupation listed as “at home”, while the rest of the girls had none recorded. Arbizensy, Lucious and William had all attended school within the previous year, but none of the children could read or write. By 1872, the family had moved to Arkansas, where son John Watson was born that year. Another daughter, Florance Watson, was born circa 1877 in Arkansas. The 1880 census recorded the family living on a farm in Archey Valley Township, Van Buren County, Arkansas. Arbizensy had moved out, but John and Sarah still had the rest of the children with them. It was recorded that Sarah and the children could neither read nor write, but that Laura and Rixey had attended school within the census year. By 1886, sixteen years old Rixey Watson was involved with a nineteen years old man named Patrick Lyons Bohannon of Bear Creek Township in Searcy County, which bordered Van Buren to the north. On 12 “Febry” 1886, Patrick paid a one hundred dollar bond for a marriage license, with C. B. Cotton signing as security. Since C. B. Cotton was also a Justice of the Peace, he performed the marriage ceremony for Patrick and Rixey on 18 February 1886. The marriage record was filed by M. Dampf, county clerk. Circa 1887, Patrick and Rixey had their first child, a daughter named Sarah M Bohannon. Unfortunately, there is no data from the 1890 census as it was destroyed in a fire in 1921. On 31 December 1893, their daughter Sylvannia Bohannon was born. Circa 1895, their son John Alexander Bohannon was born. Rixey Ann Bohannon, née Watson, died on 17 October 1895 at the age of 26. She was interred at Bear Creek Cemetery in Searcy County, Arkansas. Rixey’s name variations include: “Rixey Watson” on the 1870 census; “Rixy A Watson” on the 1880 census; “Rixey A Watson” on the marriage documents; “Roxann Rixey Watson Bohannon” at Find A Grave. Member trees on Ancestry have her listed variously as “Rixey Ann Watson”, “Roxanne Watson”, and “Roxy Watson”. Since her middle initial was given as “A” on at least two sources, I suspect that the “Roxann” on her grave marker may be a conflation of “Rixey Ann”, so I have recorded her as Rixey Ann Watson in my own family tree. Patrick was listed as “P.L. Bohannan” on the marriage documents. I took the middle name “Lyons” from various member trees on Ancestry, but I admit that I do not have a hard source for it. I thought this was Graham Ancestry! What has this got to do with the Grahams? Well, there is an indirect connection here. Patrick and Rixey’s daughter Sylvannia Bohannon would marry James Madison Watts in 1912. James was the son of James Newton Siler Watts and Eliza Ann Graham. But there is a direct connection you’ll have to wait to see. Ancestry.com: United States Federal Census of 1870, 1880, and 1910; California Death Index, 1940 – 1997 (for Sylvannia); Social Security Death Index (for Sylvannia). 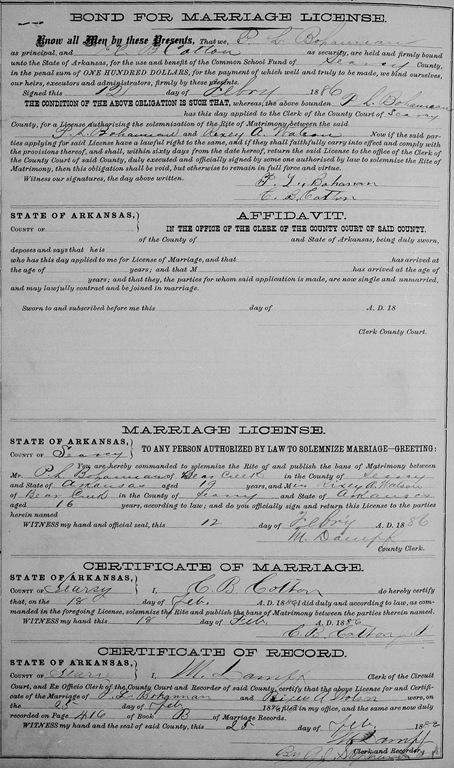 FamilySearch.org: Arkansas County Marriages, 1837 – 1957. Find A Grave: Memorial for Roxann Rixey (Watson) Bohannon.